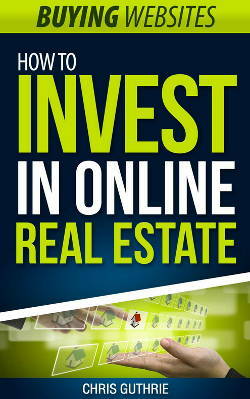 Would You Like To Learn How To Invest In Online Real Estate? Inside this book you’ll learn the tactics and strategies necessary to buy websites and turn a profit as quickly as possible. As an investment strategy buying websites can provide an excellent ROI, but there are a lot of mistakes that beginners make that you can learn avoid by reading this book. As is usual, the book starts with the book cover illustration, the title page, copyright notice and disclaimer. Next up is a “free bonus” page with a link to his site where you can get his free checklist. Most books or courses just give you a checklist without making a song and dance about it, but I guess he’s the type of guy who likes to be seen as being there to help people. Hello! My name is Chris Guthrie and I currently generate a growing six figure income from my online business. I have a wide range of income sources that include websites I have purchased as investments. Hmm, that might have been better in an ‘About the author’ section for readers to skip, especially if they’ve heard his amazing rags-to-riches story a hundred times before. It sets my teeth on edge anyway. Most truly successful people never boast about how much money they make. Well, really. It’s not quite the done thing, is it? “Hi, I’m Kay and I make a million dollars a year. Please buy my $4.99 ebook.” Somehow it doesn’t quite add up. Next comes a lot more boasting about how he bought a website for $500 and made $7,000 profit, then he continued with this strategy until he sold one for six figures. Chris, please give it a rest. Can there be anyone on the planet with an interest in websites who hasn’t heard all of this before? At last, he gets down to it and tells us that it’s important to identify income and traffic history and sources. This is not exactly ground-breaking information. Then there’s a bit about where to find out about the website’s traffic, eg the seller’s stats and some publicly available data. That’s fine, and possibly useful for a newbie. You also need to look at the age of the website and the quality of its content. (By now we’re about 25% of the way through the book.) He then suggests checking CopyScape for duplicate content, but makes no mention of any of the tricks which can easily be used to fool CopyScape. Then he explains why the quality of links are important. He mentions that you must consider the ease of running the website and the time involved in doing so. This section concludes with a recap of all these things you need to think about when considering whether or not to buy a website. It’s all very well to say that you need to look at these things, but how do you verify the figures and have confidence in the accuracy? Perhaps he’ll get to that later. Next he tells us the “traditional” places to look for websites. Flippa is the dominant marketplace. Heck, Flippa was founded in June 2009 and so if that’s “traditional”, then this piece of information is gonna make some of us feel like antique dealers. Hang on a minute, we seem to be quite a way through the book now and I’d thought we were still in the Intro chapter. The book doesn’t seem to be structured, it just seems to hurtle from from one subject to the next. He then gives a list of what’s already been covered, and moves on to enumerate and briefly describe nine additional factors to watch for which, he says, are specific to Flippa listings. Sure, some of them are, such as incomplete listing information on Flippa, but watching out for trademark infringements isn’t Flippa-specific. This book is really starting to confuse me. Then, as a “thank you” for reading his book, he offers a $10 discount coupon for something, and tells us that there are a lot of low-quality sites listed on Flippa. I had a look and it turns out he’s selling SiteFinderPro for $27 (there’s that magic number 7 again). Apparently this enables you to “unearth hundreds of hidden, gold-nugget sites, with huge traffic and income… that nobody even knows about.” Apparently it’s the ultimate Flippa research weapon. Now we’ve got past that little bit of self-promotion and upselling, let’s get on with the book. Next he explains that if you’re looking to buy or sell websites at the higher end (as he does), then it’s probably better to use a broker. He lists some brokers. He follows that with some stuff about how to pay for the website, and a disclaimer that he’s not a lawyer so you might need to seek professional legal advice. Plus another plug for the thing he offered as a bonus at the very start. He gives a brief description of the transaction process using Escrow. The next section is about how to transfer the website. This goes on for several pages. And then we’re on to what to do after you’ve bought the website. The first thing (Strategy 1) you want to do is to increase the traffic to it. Following on from some more of stating the bleedin’ obvious, he then says: “(I know it’s obvious – as some of the best advice generally is)”, thus implying that he’s giving you the best advice. Somehow I feel sceptical about this. Strategy 2 is to generate more revenue from the traffic. The explanation of the strategy consists of two sentences suggesting that you can improve your efforts on the existing sources of income and identify new sources. He shows us a chart of a website page laid out into zones. You know, the usual thing about ad placement. He says that ads placed closer to the content are likely to perform better. Next he goes on to discuss each zone in more depth. Hmm, I was almost asleep but this has wakened me up. It’s almost quite interesting. It’s a bit of a spin on the heat maps data, but this could indeed be very useful for a newbie. Then he tells us that it’s important to test. Yawn. Don’t jeopardise your account by breaking any advertisers’ T&Cs. You can read Google’s T&Cs – here. Where? On his website, of course. (Silly me. If I wanted to read Google’s T&Cs, I would have looked on Google.) Then he tells us that there are alternatives to AdSense and gives two examples. Fair enough. Then he recommends building an email list and suggests how to bombard people with your affiliate promotions. (Automated emails at timed intervals.) Also if you add more ad blocks, you can increase your income. (And Google is liable to bite you, but he doesn’t mention that.) Next up is some bland advice about ways to monetise a site, such as advertising and affiliate marketing. This provides an excuse for more boasting about how great he is. I’ve earned over $ 100,000 in commissions from Amazon’s affiliate program and even sold one of my top Amazon affiliate websites in a six figure deal. You can also monetise a site by selling your own products. Also look at your competitors for ideas. And the next three chapters are case studies of how he’s done it, because he wants to help you to learn by example from him. I’ve almost lost the will to live but I’ll soldier on. We’re nearly 75% of the way through now. Case Study 1 – how he turned $500 into $7,000. I’m getting that same old feeling of déjà vu yet again. Is it not possible to read anything by Chris Guthrie without getting this story every time? Anyway, all you have to do is to follow the simple steps he’s outlined in this book. Look! You can see his earnings. There’s a screenshot to prove them. Plus it made money on AdSense. Not a lot (only a bit less than 900 bucks over almost three years), but enough to boast about anyway. Overall, he made a return on investment of 1484.55%. Maybe he did. I wonder if he factored in the cost of his time or any other costs into that claimed ROI figure. Anyway, he says, the site doesn’t do so well now because of a Google algo change. He doesn’t bother with it any more now because he’s concentrating on his bigger sites. In which case, Mr Guthrie, could you please explain the relevance of including a case study of something that no longer works? There are loads of us who could tell you how we raked it in many years ago but these methods don’t work now. What is the point of telling newbies how you succeeded back in the year oatcake? It’s history. This does not teach someone “how to invest in online real estate” today. Case Study 2 – how he recouped his $4,000 website investment in 7 months. He was lucky enough to spot an undermonetised site and he monetised it. This case study is a spiel to persuade you of the fantastic opportunities there are for you to do the same. Yeah, right. The marketplace is just full of opportunities for newbies to come along, pick up these sites for a song, and monetise them. Case Study 3 – I can hardly wait. This one is about what can go wrong when you buy a website. He bought a dud, in other words, and got conned because he didn’t do his due diligence properly. I think this case study is to gain your trust by letting you see he can make mistakes too. He’s human. Then he gives the briefest of brief mentions to some of the risks involved in buying a website. Sure, everyone makes mistakes, but this basic stuff is just an anecdote and I can’t see how it could help anyone to avoid making obvious mistakes when buying websites. I’d hoped we were at the end, but unfortunately there’s a bonus. This is about selling websites. It’s not something he normally does because he hangs on to his to increase his revenue stream. However, if you do want to sell a site, it involves rocket science about preparing it for sale. Actually, this just seems to be tacked on as a space filler. Anyway, here goes. When you are trying to sell a site, the buyer is likely to want proof of traffic and income. They will also want proof of ownership. Proof of ownership: If you’re selling on Flippa there is an ability to upload a file to your website to confirm ownership, yet for some reason sellers don’t always do this. This is a simple thing to add so make sure you provide proof of ownership. Huh? That doesn’t prove ownership. It only proves that the seller has access to the server and is able to upload a file to it. The seller could be an employee or business partner of the owner. The owner may have allowed FTP access to their server to a wide number of people. Or they may have failed to secure their site adequately, been tricked into giving away their password, or been the victim of a brute force attack that got lucky. You’ll also need to give an explanation of the business model and provide a reason for selling. Then there’s advice about selling on Flippa – you should answer any questions which potential buyers might ask you. Golly gee, now we know everything and can venture off into this wonderful land of making six figure incomes by buying and selling websites. The book concludes with a short list of useful places to find info about buying and selling websites. Plus there’s an additional plug for his SiteFinderPro. It was disappointing. I had wanted to ask Amazon for a refund but then I remembered that I’d got the book free in the first place. I think Chris means well but he seems to have fallen into the Dark Side of making money by telling people how he made money several years ago. The book was far too superficial for anyone except the rawest newbie. It was reasonably well written although it didn’t seem to be structured very well into chapters or clearly defined sections. I’ve seen a lot worse. However, it skated over the surface of the subject without really tackling the meat of the due diligence process or covering what people need to know when they’re considering whether or not to buy a website. It’s pleasant enough light reading but it’s not something anyone should rely on for advice. I got the distinct impression that this book was mostly about a personal journey. Selling this book based on his experiences several years ago seemed to be a new source of revenue for him because a lot of what he talks about doesn’t work any more anyway. Plus it’s a sales tool for the tool he’s selling to filter Flippa sales listings. I don’t recommend that you buy the book, but just in case you are a complete newbie who thinks they might benefit from it, or if you are a Chris Guthrie fan, then here are my affiliate links to purchase the book. I read this book too. I can’t remember if I got it for free after subscribing to his newsletter or if I paid 5$ for it. Anyway, at the time of the reading I did not knew much about Chris Guthrie and found his story interesting. As you say though, there is not real value in this book, I did not learned a lot and I also found that his tips were obvious and that even a new guys to e-commerce would already know about them… Like put your affiliate links in your images, try to link the image with the corresponding product on Amazon website… Ok, thanks for that Chris. After that reading, I was introduced to his podcasts, which are available for free on iTunes or on his website. I think there is much more value in them than in its book. The only annoying part is that he keep repeating about his 6 figures deal. He made 15 episodes and I think he stopped, some of them are worth listening to. I found that the podcast number 12 was particularly inspiring. Thanks for your comment. The trouble with a lot of these books (I’ve reviewed three of them in the last week), is that there’s not much substance to them. Apart from that, what I particularly didn’t like about this book was that he seemed to be using it as a marketing tool to sell SiteFinderPro, which he talks up because he sells it as an affiliate. I saw your postings about this book on the UKBF forum and followed you here so I could read the review you linked to. I am interested in buying and selling websites so I’ve been buying a lot of books and joining forums to learn about it. Most people say that Chris Guthrie’s book is the authority on the subject. So I am surprised to see you swimming against the tide of popular opinion. On UKBF someone asked about buying and selling websites and everyone recommended this book except you. Is it a case that everyone else is wrong a you are right? Why should people believe you? Chris is a respected flipper and an internet marketing guru. I would be interested to know why you think you are qualified to criticise his book in this way. Despite what you recommend I will buy this book anyway and make up my own mind. I also saw teh forum post and came over to read the review. I have read Mr Guthrie’s book and didn’t find it useful. It’s ok for a noob but if your serious about flipping you need something more detailed than this. It is funny how everyone says if you want to learn about websites this is the seminal book to get. @Flopper – that’s a funny name. Have you had some flops when flipping? LOL. Yep, we’re thinking along the same lines in our assessment of that book. I’ve read loads of books on this subject and most of them are like this – just some superficial stuff to get you into their “funnel” so you buy their stuff. I’m seriously considering writing a book on the subject myself – without all the hype. @Bill – there’s not much more to say about the book than what I’ve already said in my review. Why am I qualified to criticise his book? I guess every reader is qualified to say what they thought of any book. Chris is a good salesman, so of course people are going to believe what he says. On the other hand, I can see through the spiel to what it really is – just another way to make money by purporting to teach people how to make money. It seems quite clear to me. Yet Chris seems to have a large following of people who hang on his every word. He’s a nice guy actually. I’m just saying that I don’t think this book is very useful.